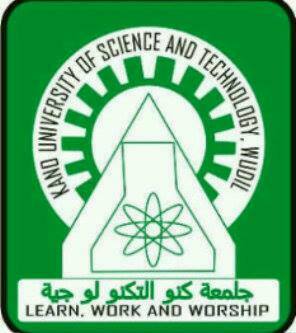 The management of the Kano University Of Science And Technology (KUST), Wudil, has released the acceptance fee and admission letter printing procedures for the 2018/2019 academic session newly admitted candidates. KUST Acceptance Fee Payment Procedure. You can pay for your KUST acceptance fee PIN online or via bank. You will pay the sum of Three Thousand Six Hundred and Fifty Naira only (N3650.00K) which includes the bank charges and acceptance fee. Follow the procedure outlined below to purchase your PIN online. Select the number of PIN to buy i.e. 1. Then click on Buy Now button to proceed with your acceptance fee payment. Pay the sum of Three Thousand Five Hundred Naira only (N3500.00K) non-refundable Acceptance Fees through KUST COLLECTION Account No. 1130074105 at any branch of Zenith Bank PLC. Candidate shall present himself/herself on 8th April, 2019 at the University premises for screening at the designated area of his/her programme.